Shri Dattatreya is a very ancient incarnation, highly venerated through the ages. 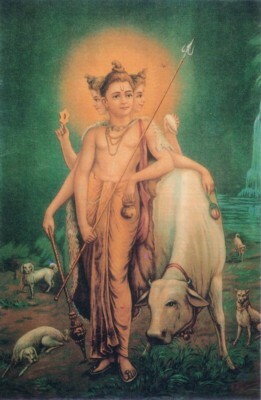 Dattatreya – a Universal Guru manifested in the recess of time of ‘Kaliyug’, when humanity had gone far from its pristine state and steeped into threshold of a time when all kinds of vices had already taken root, and the pious souls made fervent appealed for the salvage of the mankind surging forward in manifold way. He had descended on this earth to establish ‘Satya‘ (the Universal Truth), ‘Rta’ (the Cosmic Order), Dharma‘, (the perennial principles), in all its entirety. Seer Atri was one of such Seers who had ‘seen’ and experienced the Brahman, the eternal Wisdom. To him was born a son, the product of the Grace or the Divine Will, which was the manifestation of all three Primal Energies of Brahma, Vishnu and Shiva. He was ordained with the three energies; He came to have the concentrated wisdom of the three God-heads or symbolically three heads. The three heads signified as Brahma: ‘Tejas’ personified, Vishnu: ‘Ojas‘ personified, Shiva: ‘Tapas’ personified. Under these heads, illumination of knowledge, vigorosity of action and stringency of penance were represented as three aspects or state of being of the same. Birth: Dattatreya had descended into the realm of world as progeny of Atri and Anusuya, a sage couple of the Vedic age. Anusuya became very famous for her devotion to her husband. She was the embodiment of chastity. Such was her spiritual power that, even hard earth turned soft and smooth for her as she walked about. This pious woman induced jealousy and envy in others, however, and the three Gods decided to prove these doubting elements how wrong they were. They transformed themselves into mendicants, approached the hermitage of sage Atri and begged for alms. At that time sage Atri was away at the river offering his daily oblations. Anusuya came out and offered food to them. They made a strange request; the food be prepared and served to them by Anusuya, without clothes. In the Indian tradition any ‘athithi‘ (guest) cannot be turned away, as they are considered to be an aspect of God. Hence she was placed in a dilemma. She smiled to herself and reflected thus: ‘I am totally purified by the long association with the holy sage Atri. What harm can the god of lust ever do to me? So I do fear nothing. As they have sought food from my hands, I look upon them as my own children and not as strangers and grown up men!’ Her thoughts – the thoughts of a pious and chaste person – instantly became reality; the elderly guests became babies! Sage Atri on his return to the hermitage saw his wife Anusuya fondling three babies. Anusuya said “These children are the gift of God to us who have been childless so far”. Sage Atri was overjoyed and named them Datta, which means ‘given’. At this the three Gods reverted to their real forms and disclosed the truth. They extolled the power of chastity and purity of Anusuya which vanquished the combined and colossal powers of all three of them. Sage Atri and Anusuya prayed that they should remain as their sons. They consented and the three Gods merged into one body. This is how Shri Dattatreya incarnated and is known as Gurudeva Datta – the Guru of all Gurus. Shri Dattatreya or Datta Guru, an incarnation who came to light the lamp of wisdom among the people. Shri Dattatreya is a splendorous form. His face radiates all wisdom and draws us away from the lures of the world. Though He is the Supreme Lord of this universe, yet He is a total and supreme recluse. Though He moves from place to place, His favorite abode is the Holy Audambar tree (A type of fig type, Ficus glomerate). He has matted hair on His head. His body is ever smeared with holy ashes and He wears tiger-skin for His garment. A cow and four dogs are always with Him as His constant companions. He is an ‘Avadhoot’, ever anchored in Spirit, but always overflowing with compassion for all the beings and the entire creation. He is the embodiment of total Godhead. All the aspects of Godhead are fully manifest in Him. His faces and form are ever radiant with peace and divine charm. • The Cow, which is always with Him, represents the Mother Earth and Dharma. She is the wish fulfilling cow ‘Kamadhenu‘. • The four dogs symbolise the four Vedas – the external repositories of Spiritual Wisdom. • The ‘Sudharshana chakra‘ , disc indicates that He is beyond the cycles of time i.e. the past, present and future and His holding of ‘chakra’ means He is the controller of time. • The Conch represents the eternal sound ‘AUM’ – which is the manifestation of the Spirit. It is also the life principle in us and the cosmos. • The ‘Bhasma‘ ashes indicated His ‘Vairaagya‘ dispassion as well as His purity. Ashes indicate the evanescent nature of all created nature of all created objects and the ultimate state of all matter. • He always carries a begging bowl so as to teach us the lesson that we will have to share our wealth and food with others. • The Japa-mala, rosary He wears reminds us that our primary duty is chanting the sacred name of the Lord and meditating on the feet of the Lord, and our redemption depends on this discipline alone. Shri Dattatreya, in order to bless His devotees and the righteous ones, wanders about in the guise of a random guest at the lunch hour. That’s why it is said that a random guest has to be treated as the very embodiment of Lord Dattaterya. God’s creation was His Guru: He had twenty four Gurus. Shri Dattatreya had twenty four teachers from nature “many are my preceptors,” he told King Yadu, “selected by my keen sense, from whom acquiring wisdom freely, I wander in the world…. The earth, air/breeze, sky, fire, the sun, pigeon, python, sea, moth, elephant, ant, fish, Pingala the courtesan, arrow-maker, infant/playful boy, the moon, honeybee, deer, bird of prey, maiden, serpent, spider, caterpillar and water are my twenty four preceptors. 1. Yama – non-killing, truthfulness, non-stealing, continence, and non-receiving of any gifts. Moral discipline. 2. Niyama – cleanliness, contentment, austerity, study and self-surrender to God. Moral discipline Yama and Niyama are moral training and form the basis of Yoga. As these two become established, the Yogi will begin to realize the fruits of his practice. 4. Pranayama – ‘Prana’ is the life-force, ‘yama’ is control. ‘Pranayama’ consists of breath control exercises. 5. Pratyahara – withdrawal of senses from sense objects. 8. Samadhi – the transcendental or super conscious state of being one with God: Principle tenets of the Dattatreya tradition. 1. Everyone should know oneself first and should know one’s own reality, which is but God. 2. One should realize the relationship between God, man and creation – the underlying kinship, unity and oneness of these three entities. Brahman is the immanent and all pervading reality in all matter – it is the origin, the support and sustenance of all. 3. To obtain this vision and discern this truth, one should conquer one’s ego through Yoga and renunciation. 4. Guru’s grace is indispensable. One has to surrender oneself totally and unreservedly at the feet of the Guru. His grace awakens ‘Jnana’ (illumination) by which we can recognize the Reality of Brahman, which is the real self of all. • Have purity of thought, word and deed. • Do ‘Nama smaran’ – remembrance of the Lord’s name and meditation on it. • Have compassion and love for all beings. • Render selfless services at the feet of the Guru and surrender completely and unconditionally. 3. Shree Swami Samarth of Akkalkot. 4. Sri Sai Baba of Shirdi.